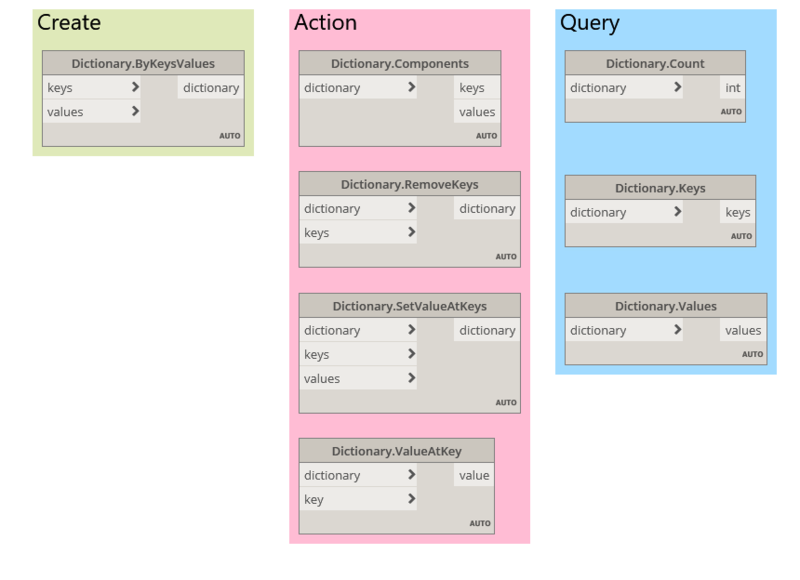 Dynamo 2.0 exposes a variety of Dictionary nodes for our use. This includes create, action, and query nodes. Dictionary.RemoveKeys will produce a new dictionary object with the input keys removed. Dictionary.SetValueAtKeys will produce a new dictionary based on the input keys and the values to replace the current value at the corresponding keys. Dictionary.ValueAtKey will return the value at the input key. Dictionary.Count will tell you how many key value pairs are in the dictionary. Dictionary.Keys will return what keys are currently stored in the dictionary. Dictionary.Values will return what values are currently stored in the dictionary. Overall relating data with dictionaries is a magnificent alternative to the old method of working with indices and lists.